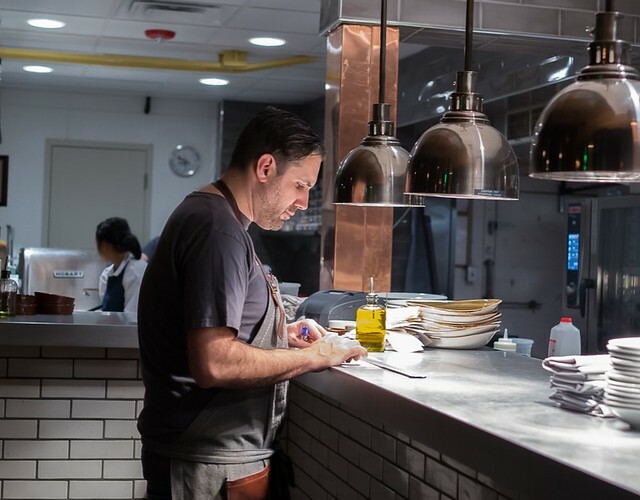 There’s no doubt that Michael Scelfo is one of the hottest chefs right now in Cambridge. His first restaurant, Alden & Harlow in Harvard Square, is pretty much always packed. It’s virtually impossible to get a reservation there at the last minute, especially if you want a reasonably normal time slot. Chef Scelfo has won a ton of awards. Alden & Harlow was one of fifty restaurants nominated by Bon Appetit in its America’s Best New Restaurant list. Boston Magazine included it in its 50 Best Restaurants in Boston list and awarded it Best of Boston: Best New Restaurant. Food & Wine Magazine even called out Chef Scelfo’s burger as one of “10 Must-have Burgers in 2014”. And he’s at it again. Chef Scelfo’s newest gig is as consulting chef for Naco Taco, a new restaurant by Alex Tannenbaum and Brian Lesser. Tacos have always been one of Michael Scelfo’s passions, and Naco is the perfect outlet for him to express his creative juices. Inspired by the style of food parks in Austin, Texas and Portland, Oregon, Naco includes a huge outdoor patio, a semi-permanent “truck”, and a permanent indoor space with a huge bar and lots of additional seating. With only a beer and wine license, Naco makes the most of it by offering a rotating line of 30 beers, wines on tap, sangrias, and beer cocktails. For those that don’t drink, there’s non-alcoholic agua fresca and horchata. One unseasonably warm spring evening, Bryan and I decided to come stop by and check it out. We arrived around 6:45PM and the place was already packed outside. Although there was plenty of seating indoors, we opted to wait 30 minutes for a patio seat. The estimate was close, and in about 35 minutes we were seated at one of the highly coveted patio seats. The menu is pretty small and consists of four main parts. Tacos ($4 each) come on a house-made corn tortilla made with lard. Each tortilla is topped with a protein (or avocado), cojita (cheese), cilantro, onions, and a lime wedge. Por la Mesa translates to “For the Table” and includes everything from salads and beans to crispy pigs’ ears chilaquiles and guacamole ($5 to $9). Salsa y Cremas, include various types of salsas or creamy dipping sauces that you can eat with chips ($3 for one; $15 for all 7). Finally, Tortas ($9 – $13) are Mexican sandwiches made with pickled corn telera bread and accompanied by overnight frijoles machos (black beans), pickled onions, cilantro and cotija cheese. The salsas and dipping sauces sounded interesting, so we went ahead and ordered all of the salsas ($15 + $3 for chips). The chips were fried in house and were similar to other house-made chips you find around Boston. There were free refills, which we took advantage of at least once. Pictured above are all the salsas and cremas we tried. Clockwise starting from the orange one at the left: grilled carrot crema; classic pico; burnt pineapple salsa; pumpkin sikil pak (a savory pumpkin seed hummus with tomatoes and habaneros); roasted beet & chipotle salsa; smoked almond salsa; and avocado & tomatillo crema. It was interesting to try them. We both really liked the pumpkin sikil pak and the smoked almond salsa. The pico was normal, and the pineapple salsa did have a nice, charred pineapple flavor that reminds me of grilled pineapple. All in all, it was fun, though it was a lot of salsa and we got quite full eating it. I got a Wood Grilled Gem Salad ($8) from the “For the Table” section of the menu, a fork and knife salad with grilled whole heads of gem lettuce topped with grilled corn, radish, cotija creama, masa crumble, and pickled japapenos. It was refreshing and citrusy, though the dressing was a bit on the thick side. All in all, it was pleasant. Not mind blowing, but perfectly enjoyable. We went a bit crazy with the tacos and ordered most of them. All tacos comes with cojita (cheese), cilantro, onions, and a lime wedge. The other ingredients differentiate the tacos. We tried to order the beef tongue taco (lengua), but it was unfortunately sold out. Below, are the tacos that we did end up ordering. We started with Pork taco, which included spit roasted al pastor with burnt pineapple salsa. The burnt pineapple salsa definitely adds a sweetness to the taco. The overall taco is balanced and pretty tasty. The Chix (left) taco consists of crispy braised chicken thigh, cotija crema, and fermented kale. The slight tartness from the kale balanced out the richness of the dish. The Fish (middle) taco includes deep fried smelt, salted cabbage, avocado and tomatillo. Smelt naturally has a very strong fishy taste, similar to the likes of mackerel and sardines. I personally prefer fish tacos made with milder fish like cod and loaded with fresh salsa. This one was definitely heavier, both from the rich ingredients and the strong flavors from the oil fish. It was OK, but it wasn’t my favorite. The Smoked Tri Tip Steak taco, which comes with grilled carrot and a chile sauce, was probably my favorite of the three. The beef was juicy and the overall taco was satisfying to eat. This free taco was the Lamb taco, which consisted of cured lamb belly, sikil pak, pepitas (pumpkin seeds), and pickled radish. This was definitely one of the more interesting tacos, incorporating various textures and flavors, including one of the dips we had earlier in the meal as well as pickled radish to balance the overall richness. A Tortas is a Mexican sandwich. They offer various types, including cordero (lamb belly – $12), cabeza ahogada (pig’s head – $10), pescado frito (crispy smelt – $11), chingon (shaved tri tip – $13), and the one we ordered, shishito y huevo fundito, a vegetarian sandwich full of grilled shishito peppers, chihuahua fresco, crispy onions, cilantro aioli, pickles, and a lovely fried egg inside. I really enjoyed the flavors of the ingredients inside. I liked how the crunchy peppers balanced out the richness of the fried egg. I personally wished the bread wasn’t so thick (I like a ratio that includes more *stuff* and less bread), but that’s just my personal opinion. The flavors were great. As the sun sets, the evening patio changes its feel as the sky lights up with strings of mini bulbs. The patio is as packed as ever. People are having a really good time out here. The patio is definitely an improvement from the parking lot of the Korean market that used to be in the space. The area feels festive, and it draws people in. It’s still early. The restaurant opened on May 11, 2015, so it’s been less than three weeks. Expect to see service hiccups and timing mishaps (not surprising during opening month). The food is creative and fun. Sometimes it works well; sometimes the original Mexican version is superior. I’m not sure if it’s a destination restaurant per se, but overall the food is creative and tasty, and it’s worth at least trying once to see if you like it. If you’re in the neighborhood and the weather is nice, the patio has a great vibe. Just try to ignore the industrial looking buildings around. Prices are a bit high. The tacos are tiny. According to Bryan, the size of the tacos is authentic. The difference is that they wouldn’t cost $4 each in Mexico, or even at most places around Boston. For me, I appreciate the ability try more tacos since they are each so small. However, I could see some people needing to order a lot of tacos to get full. I think we spent about $35/person, including 2 beers (plus an additional $18 at the bar on drinks while we were waiting for our table). All in all, it’s still a great addition to that section of Central Square. I love how the outdoor patio adds life to that corner, brightening up the area a lot. It’s great to have another casual restaurant in the vicinity serving many different types of beer, creative Mexican dishes, and other fun Mexican small plates. It’s been packed every day since it opened, and I think it will continue to be this way because it really fills a void in the area.